Rental cars are readily available. 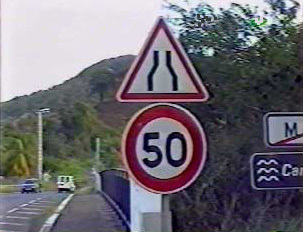 Visitors choosing to drive in Martinique need to be aware that drivers tend to go quite fast, which can be a problem for foreign drivers who are not well acquainted with the winding roads. Normally the roads have four lanes, but, quite commonly a road will narrow to two lanes. One can expect a fair amount of aggressive passing on both the highways and small streets. At night the narrow and winding roads along the shoreline are not lit; thus, particular caution is to be taken when driving at night. Pedestrians will find crosswalks and cross lights in the cities only. There are stop signs at intersections and rotaries. One should always use caution when crossing.